Ahsoka Tano is a Jedi capable of healing and dealing damage. Let’s look at the brief guide below and see what she has to offer for your team. Basic Ability: Energetic Slash – Deal Physical damage to target enemy and Ahsoka recovers Health equal to 10% of her Max Health, increased to 15% on a Critical hit. Unique Ability: Daring Padawan – Ahsoka has +45% Health, +45 Speed, and +10% Critical Chance. Whenever she suffers a Critical Hit, she loses one of these effects (in reverse order). Whenever she scores a finishing blow, she regains all of them. Leader Skill: Quick Steps – Jedi and Nightsister allies gain 14% Evasion. 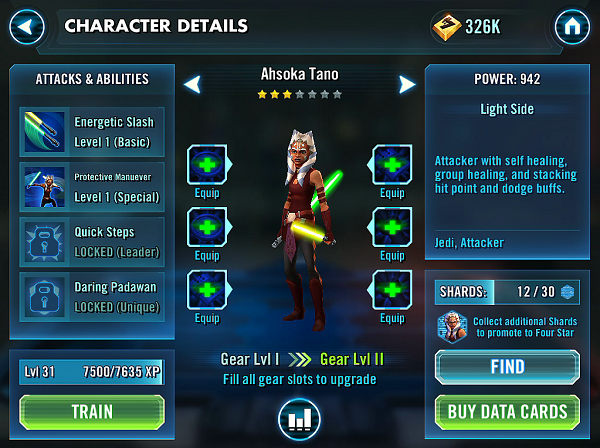 Ahsoka Tano gains 15% Turn Meter whenever she Evades an attack. 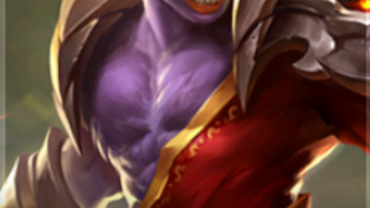 Update: Her recent re-work has made her a more balanced character. She does best when she doesn’t take any critical hits. She gets her unique bonus back when she gets a critical hit. Ahsoka Tano can be a menace if you use her with a leader like IG-88 or Darth Sidious for the critical rate bonus. She also has a very high base critical rate, allowing her to crit quite often. Both her skills are single target and they hit hard when geared. She can also heal herself with both skills, with the second skill giving the team an AoE heal when she crits. However, sometimes, the heal doesn’t help when you don’t crit at the right times, making it unreliable and people would prefer a stable healer like Jedi Consular. With the nerf of Barriss Offee, she is less viable but is still a rather strong fighter to use if you are running a nightsister team. Her evasion is good and can survive if you get a nice string of dodges.